Advisers and contestants must read all the contest rules relevant to the contests they enter. Register students: Advisers register their students in the Write-off contests online at writeoffs.jea.org. Enroll students in contests: Advisers designate which students are entered in which contests. 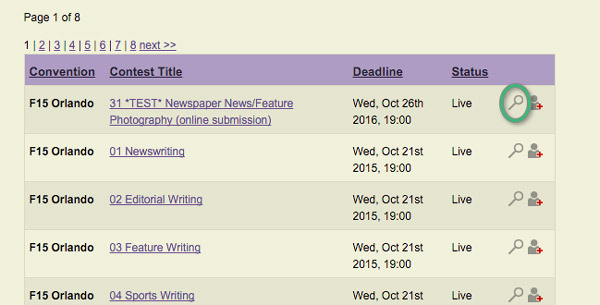 Upload entries: Advisers or students upload layouts (in PDF format) by the posted deadline. Judging: Various professionals and advisers will critique the images online. Critique session: On-site at the convention, contestants are required to attend a two-hour critique session. Winners receive a certificate and are recognized at the Sunday awards ceremony. The ratings are Superior, Excellent and Honorable Mention. Superior ratings, which are awarded with a medal, may be given to no more than 10 percent of the entries in any contest. Judges may give as many ratings in Excellent and Honorable Mention as appropriate. Review critiques: After the convention, students and advisers will be given critique packets for their entries. 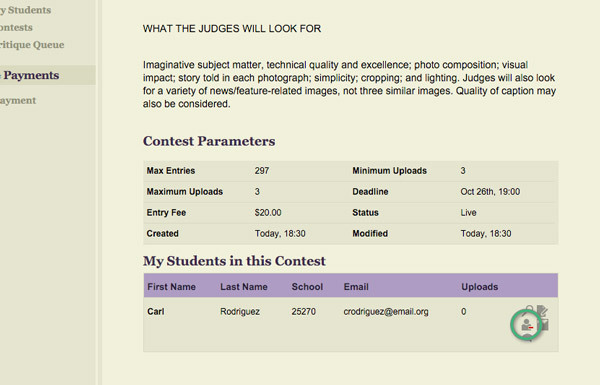 Critiques for photo entries can also be reviewed online. 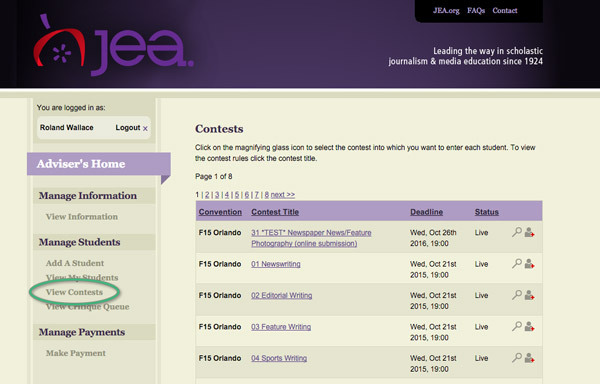 JEA members are given their login name and password for writeoffs.jea.org at the time they become a member. If you have lost or forgotten your login name or password, please contact the JEA office (staff@jea.org or 785-532-5532), and we will send it to you. 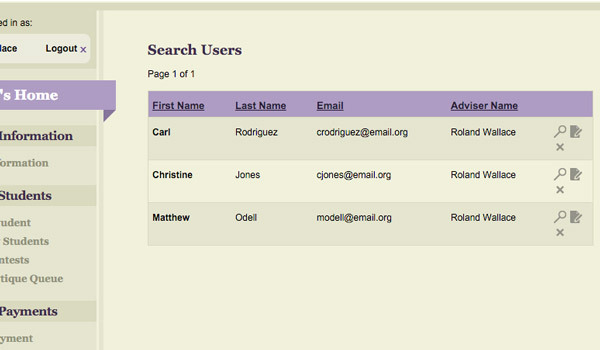 Once you are logged in, if you previously registered any students, you can view them by clicking on [View My Students]. Note that no students appear at this point. This is normal. To review a list of students you may have already registered at previous conventions, click the [Search] button with all search fields empty. 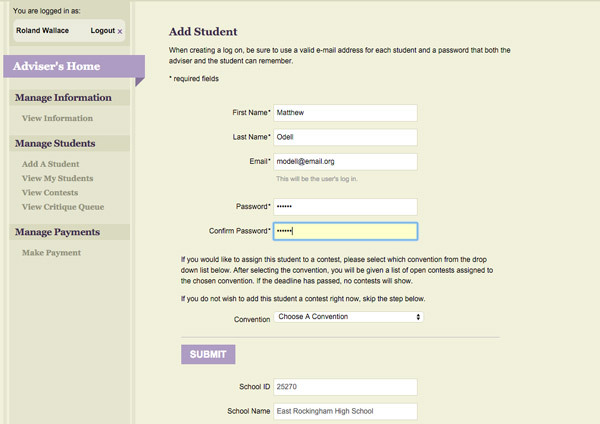 It is not necessary to create new accounts for any students who already appear in your list. Students returning from previous conventions can use their existing accounts to enter new contests. For any students you are entering in the current contest that are not already in your student list, click on [Add A Student] to enter the student's information. Be sure to enter CORRECT email for all students! The student will not receive submission deadline notifications if a valid email address is not provided. School information is automatically filled in for each student. There normally is no need to edit any of that information. Once the student has an account set up in the system, they are set to be entered in a contest. This brings up a list of students you have registered. Choose the student to enter from your list of students, click [Submit], and the student is now officially entered in the contest. REMEMBER: Each student can only enter one contest, and most contests allow only one student from each school. Some contests allow teams of two or three - check the rules for each contest. Once all your students are registered and entered in contests, you can click on [Make Payment] in the main navigation menu to arrange payment for entry fees. Invoices will be sent once contest entries are finalized. Occasionally, things come up, and students need to withdraw from a contest or be changed to a different one. This can be done easily by the adviser. Find the student's name below the contest information, and click on the [Remove Student] icon. Once removed from one contest, they can be entered in another one, if desired. For instructions on preparing photo entries, click here. For instructions on preparing design entries, click here. For instructions on preparing broadcast/video entries, click here. not wait until the last day! There are NO EXCEPTIONS. Different types of entries are uploaded by different methods. Be sure follow the correct procedure for the type of entry being submitted. Before attempting to upload a photo entry, be sure the entry has been prepared to comply with all requirements. 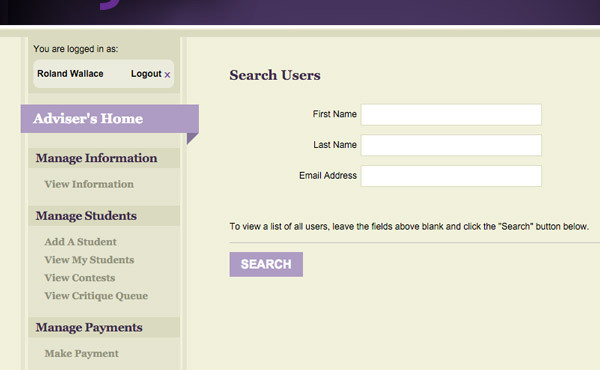 Log in at writeoffs.jea.org. Once logged in, choose [View Contests] from the main navigation menu. Find the contest for which you are submitting an entry, and click the [View Contest] icon next to the contest you wish to submit an entry. Find the name of the student below the contest information and click on the [Manage Student Submissions] icon. A page will load with controls to choose and upload your entry. Once your entry has successfully uploaded, you will see your entry listed with a thumbnail image to confirm the system has received it. If you do not see this after uploading, the entry was not successfully uploaded. Check the top of the page for any status or error messages that may be displayed there, and see the information below on Troubleshooting your uploads. 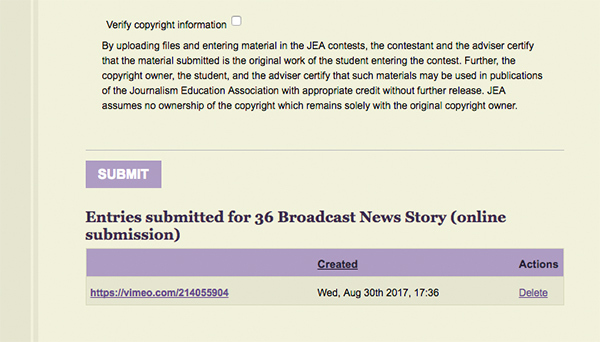 Unlike photo and design entries, the broadcast/video entries themselves are not submitted to writeoffs.jea.org; they are uploaded to Youtube, Vimeo, or Schooltube, then the information about the entry is submitted to the writeoffs.jea.org website. To perform this step, you will need the URL to where your video entry is posted and can be viewed from. To submit the entry information, navigate to the contest, then the student's name, as shown above. For instructions on preparing those entries, click here. Once the information is submitted, it's a good idea to confirm your entry was received. 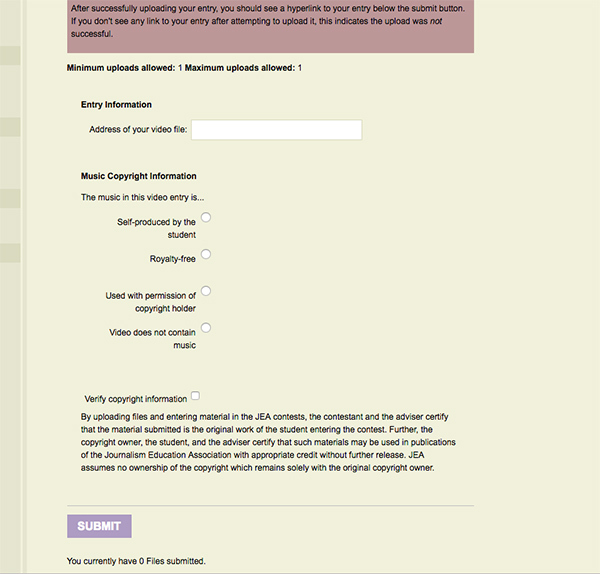 If successfully submitted, you'll find a link to your entry at the bottom of the form. Be sure to click on the link to confirm the link was entered correctly. If you click on the link and it doesn't work, try deleting the entry and re-entering it, making sure the URL is typed correctly. If an image will not upload, start by verifying that the image meets the requirements: JPEG, RGB, file size less than 2MB and image dimensions (both width and height) less than 2000 pixels. Once those requirement are met, re-save the image using Save As… and give the image a different name. That will solve 99% of any problems uploading images. The most common mistake contestants make when sizing their image is to assume that reducing the longest dimension to 2000 pixels ensures the file size is also within limit. That is not always the case. When you upload such a file, it will appear to upload successfully, but then the image will not appear as one of your entries. 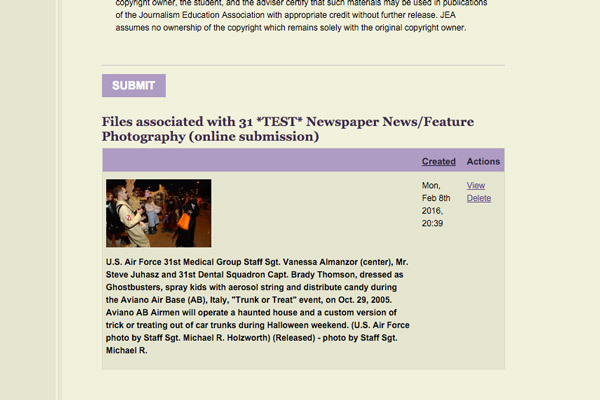 See Preparing photo entries for directions on how to produce a compliant photo entry. If you encounter difficulties getting your layout or graphic design entry to upload, or if it seems to upload okay but then doesn't appear as an uploaded entry, please confirm your PDF file is smaller than the 4 MB file size limit. If it is too large, please see Preparing layout entries for tips on reducing PDF files. The system will not allow upload of file formats other than JPG for photos, or PDF for layouts and graphic designs.